Disney subsidiary Lucasfilm has filed a lawsuit against a school teaching students how to use lightsabers, claiming a violation of various 'Star Wars' trademarks. 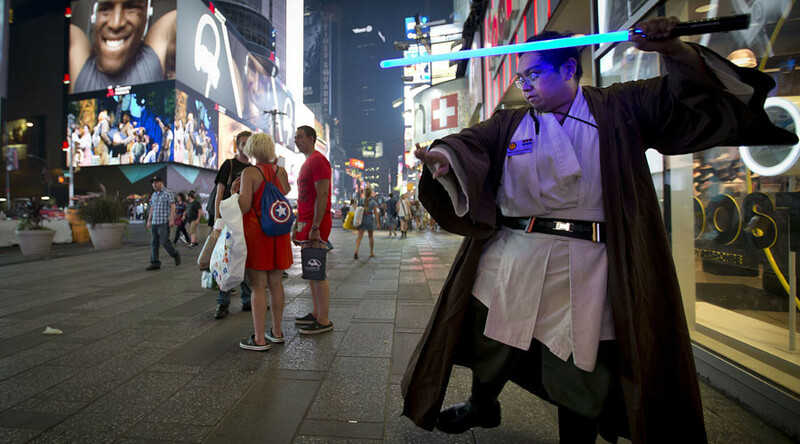 The studio is suing Michael Brown, the owner of several schools; including Lightsaber Academy and New York Jedi that teaches Star Wars fans how to use lightsabers for "illuminated stage combat." "Defendants regularly use the Lucasfilm Trademarks without authorization in connection with their businesses," Lucasfilm said in the complaint. “It is round in shape, with six wing-like shapes curving upward (three per side), and an eight-pointed star featuring elongated top and bottom points stretched into a vertical line," said the complaint. The company behind the Star Wars movies said it has sent multiple cease notices but they were ignored and that Brown has responded by filing a trademark request for "Lightsaber Academy, Inc."
The film studio is now seeking up to $2 million in damages from Brown for every trademark infringement. Brown's schools have been operating since 2005. One of them is based in New York and the other in San Francisco. The schools offer classes in the "8 core principles" of Jedi warfare, including movement and form, footwork and stances, safety, and basic strikes. The Academy's website states they "have no affiliation with Star Wars, Lucasfilm, or Disney." Star Wars is an American epic space movie franchise, centered on the film series created by George Lucas. It depicts the adventures of various characters "a long time ago in a galaxy far, far away." Disney acquired Lucasfilm in 2012 from founder George Lucas for $4 billion.